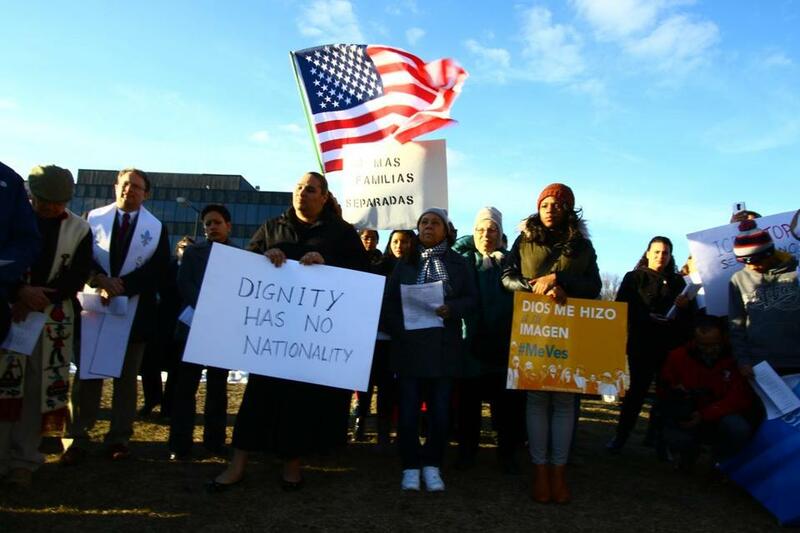 Protestors with signs outside of the ICE regional office in Burlington, during a protest on Wednesday, February 17, 2016 in concurrent with Pope Francis and Cardinal O&apos;Malley&apos;s Vigil at the US-Mexican Border. BURLINGTON — As Pope Francis prepared to pray at the US-Mexico border in a show of faith with migrants, Angela Arce picked up a bullhorn 2,400 miles away in Burlington on Wednesday afternoon and told her story. Arce fled the violence of Paraguay at 30, a law student with an infant daughter, and began a new life as a cleaner in Massachusetts. Now 47, she runs a North Shore business that employs two others and pays taxes. Her infant daughter has become an honors student at Clark University; her younger two children are native-born US citizens. The roughly 120 protesters, representing an array of faith-based and community-organizing groups, gathered to demand a nationwide stop to the deportation of immigrants who have children and are in the country illegally. 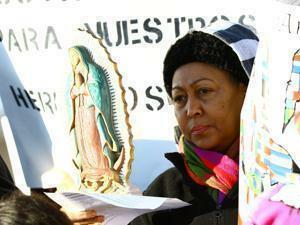 A woman holding a religious statue during the protest. Timing their rally to coincide with the Pope’s visit to Ciudad Juárez, the group underscored the anxiety of undocumented parents and their children — some citizens, some immigrants with uncertain status themselves — living under threat of deportation and separation. Rojas said his father left Mexico at 19, more than two decades ago. Ever since, he has labored six days a week as a mechanic, to provide “a better life” for their family here and to wire money to relatives back in Mexico. “Let me explain to you what his daily life is,” the teenager said. “Work, work, work, work, work” — with the added strain of fearing deportation. Arce felt similar fear but decided to declare her status in the parking lot of the deportation center, with half a dozen ICE officers watching. “I can’t be in the shadows anymore,” she explained afterward. Citing both Pope Francis’s border visit and the heated rhetoric of some presidential candidates, the Rev. Gerald Souza, a Catholic priest from the Boston Archdiocese, quoted the pope. Rabbi Margie Klein Ronkin, spiritual leader of an Ashland synagogue, shared her experience as a granddaughter of immigrants — “at a time of more open immigration policies” — and the Jewish experience of starting over as a “stranger in a strange land,” noting the biblical story of the Jews in Egypt.